What is Sustainability? Sustainability can be defined as meeting the needs of the present without compromising the needs of the future. It is ensuring that your children, and your children's children, will have the resources they need to survive. Fayetteville and Northwest Arkansas have a commitment to sustainable economic development, social development and environmental protection. These three pillars serve as a common ground for numerous sustainability standards and certifications systems across the globe. Realizing that many of our businesses have a desire to incorporate sustainability practices into their facility and operations, the greeNWAy initiative was formed in 2010 to serve as a local green and sustainable business certification program for our Chamber members. If you wish to learn more about the Initiative, or if your business is interested in joining, follow the links below. If you have further questions, feel free to contact the GreeNWAY Coordinator, Taylor Shelton at tshelton@fayettevillear.com. 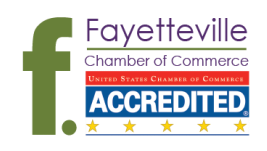 "The City of Fayetteville is focused on becoming a resource efficient community of livable neighborhoods that meets present needs without compromising opportunities for health, well-being and the prosperity of future generations".